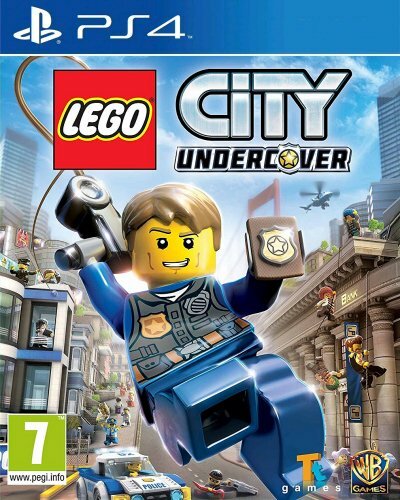 Buy LEGO City Undercover for PS4 in India at the best price. Screenshots, videos, reviews available. The Entertainment Software Rating Board (ESRB) ratings are designed to provide consumers with concise, impartial guidance about the age-appropriateness and content of computer and video games. The product that you are viewing is suitable for ages 10 and older. May contain cartoon, fantasy or mild violence, mild language, minimal suggestive themes. In LEGO CITY Undercover, players become Chase McCain, a police officer who goes undercover to hunt down the notorious – and recently escaped – criminal, Rex Fury, to put an end to his city-wide crime wave. This open-world LEGO adventure allows fans and newcomers to explore the sprawling metropolis that is LEGO CITY with more than 20 unique districts to investigate, filled with car thieves to bust, vehicles to navigate, mischievous aliens to capture, hilarious movie references to discover, lost pigs to rescue and of course, hundreds of collectibles. With 15 special assignments to conquer, LEGO CITY Undercover brings together witty, original storytelling with signature LEGO humor to create a fun-filled experience for players of all ages. Assume the identity of undercover police officer, Chase McCain, and track down the fiendish Rex Fury to finally put an end to his city-wide crime wave. With more than 20 distinct districts to investigate, LEGO CITY is a bustling metropolis that is ripe for exploration and filled to the brim with people on the streets to interact with, criminals to take down and hundreds of collectibles. As a man of many talents, Chase McCain has eight disguises to choose from, each with unique skills and abilities to infiltrate every corner of the city, allowing him to access places a regular old officer can’t. In LEGO CITY, every vehicle on the street can be commandeered with more than 100 to choose from so players can get behind the wheel of sports cars, motorcycles, helicopters and more to chase down criminals or take a leisurely ride through the urban jungle to check out the sights. Take down criminals with hand-to-hand combat or arrest bad guys using Chase’s handy grapple gun and standard issue police handcuffs. Chase is joined by officer Frank Honey, Chief of Police Dunby and paramedic Natalia Kowalski, who are just a few of the more than 300 unlockable and playable characters that gamers will meet throughout the adventure. Featuring an original storyline, LEGO CITY Undercover is chock-full of signature humor with hilarious movie and music references peppered throughout the open-world.